I’m a little famous for these cookies around these parts. A batch rarely lasts more than 24 hours, and my roommates can be seen scouting around the kitchen days later, muttering something that sounds like "any of those cookies left?" What makes a great chocolate chip cookie? In my opinion, there are several important factors. First, texture: The perfect chocolate chip cookie should be crisp around the edges, but chewy in the center, even days after baking. 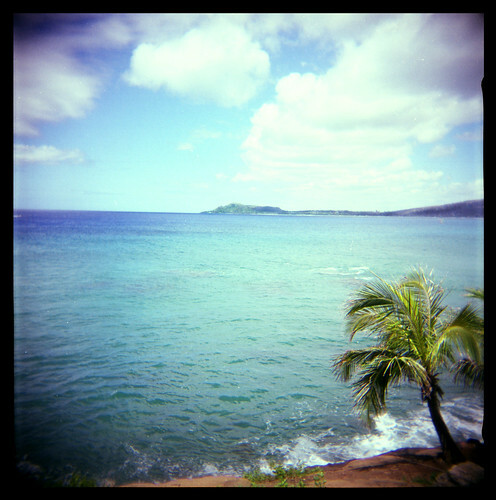 Greasy, floppy, or cement-like textures are undesirable. Secondly, form: I prefer a cookie that’s about as big around as a can of soup, and thick enough to really bite into. I consider those dinner-plate-sized cookies I’ve seen at various coffee-shops to be an abomination, but tiny little bite-sized Chips Ahoy are no more appealing. 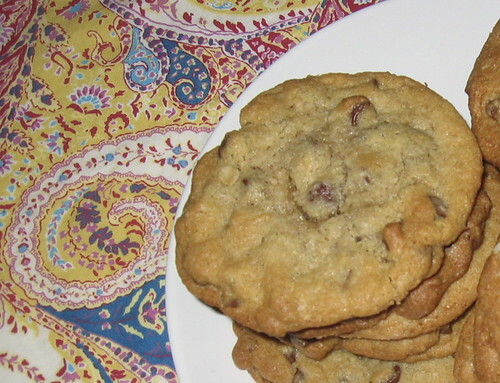 Lastly, taste: Chocolate chip cookies are a classic and should not be fooled with, taste-wise. However, tiny variations from the standard recipe on the back of the bag of chocolate-chips can really take a cookie from tasty to transcendental. 1. Grind the oats in a blender or food processor. 2. Measure the flour, baking powder, salt and cinnamon into the blender jar (or food processor) and pulse to thoroughly combine all the dry ingredients. 3. Cream together the butter and both sugars. 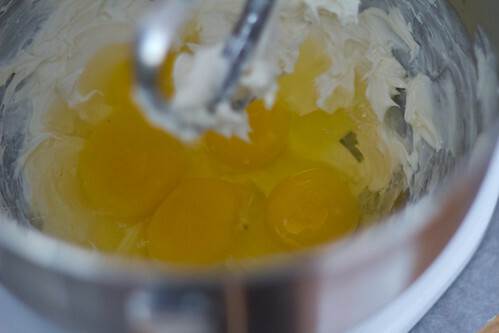 Add eggs, lemon juice, and vanilla, stirring well after each addition. 4. Combine the dry ingredients with the wet stuff, and mix until fully combined. 5. Add chocolate chips and stir by hand to evenly incorporate the chocolate. 6. Refrigerate the dough for an hour or overnight. 7. Drop the dough by large spoonfuls onto an ungreased cookie sheet. Leave plenty of room for the cookies to spread as they cook. 8. 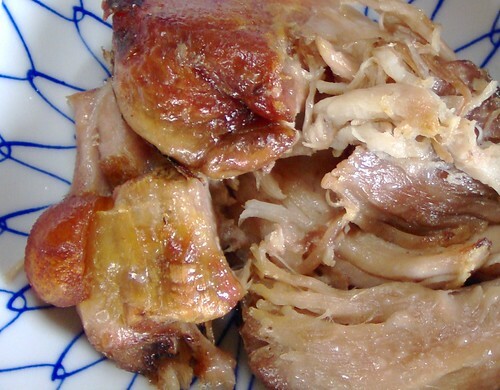 Bake at 350° F for approximately 16 minutes, or until barely golden and still slightly raw. You’ll have to do this in batches, so keep the extra dough in the fridge while the first batch is baking, and make sure the pan is completely cool before you spoon on the next round of dough. 9. Cool the cookies on the pan for five minutes, then transfer to a rack to cool completely before packing the finished cookies into an air-tight jar or sealed zipper baggies. Taking the cookies out of the oven at the right moment and not overbaking them is the first key to producing soft, chewy cookies. You can tell that the cookies are ready to come out of the oven when the edges are golden and the tops are just barely beginning to show signs of turning brown. The cookies will still appear somewhat raw at this stage, and will fall to pieces if you try to pick one up — that’s perfect. As they cool, the centers will firm up, and the cookies will be deliciously soft in the middle. If you take the cookies out of the oven when they really look done, they end up overdone and hard as little rocks. I tried a lot of recipes before settling on this one. 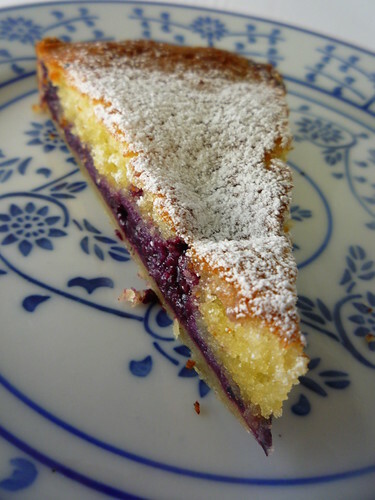 I sampled batch after batch with slightly different proportions of butter and flour. I even made cookies using shortening instead of butter. Each cookie was analyzed and thoroughly criticized before being consumed. 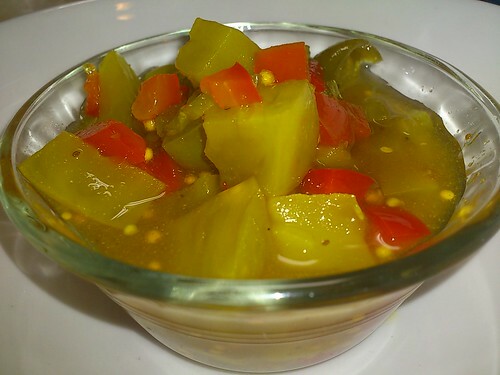 This recipe is the best I’ve ever had. The road to cookie heaven is littered with diet resolutions and empty milk cartons. It was a difficult journey, but I persevered. These particular cookies have made me famous amongst select friends, family and roommates. I hope you enjoy them too. These are my second-favorite cookies. 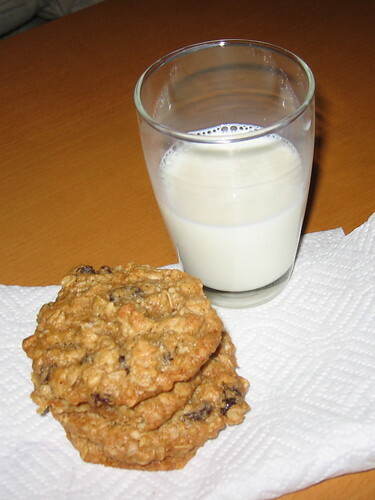 Chocolate chip cookies win out overall, but I really, really like oatmeal-raisin cookies, too. 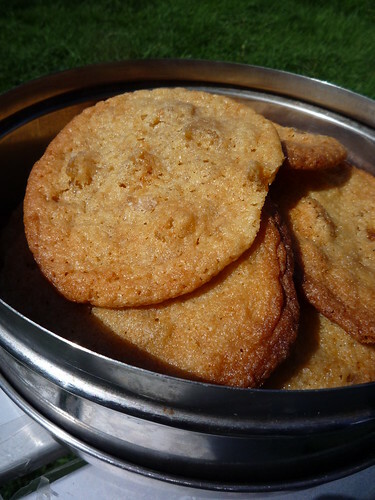 This recipe always produces perfectly chewy cookies with crispy edges. The recipe made about 3 dozen, so I wrapped up half of them and stored them in the freezer, thinking "this is way too many cookies for us to eat all at once!" Now, the next day, the cookies are almost all gone, so I’ll be raiding my freezer stash sooner than I thought. Heat the oven to 350 f. Beat together the butter and sugars until creamy. Add eggs and vanilla, beat well. Add flour, baking soda, cinnamon, nutmeg and salt, mix well. Add oats and raisins, mix. Drop rounded tablespoonfuls of dough onto an ungreased cookie sheet (leave space between them so they don’t run together when they spread). Bake ~12 minutes, or until just golden. Cool 1 minute on cookie sheet, then transfer to a cooling rack. Tip: The cookies firm up a lot as they cool, so don’t be afraid to take them out of the oven when they’re just golden but still quite soft and squishy looking. Overbaked cookies will be very hard when they cool. Recipe can easily be multiplied. Bottle and seal to preserve. 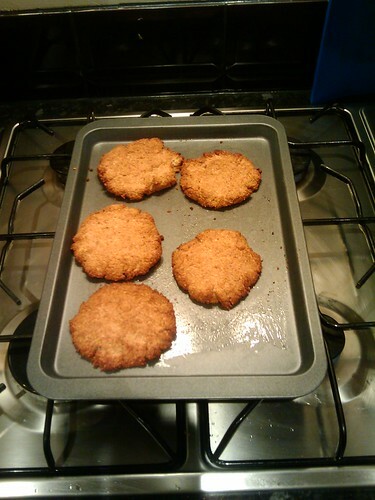 Some home-made apple, almond, and coconut cookies from a recipe by Son-of-Grok. 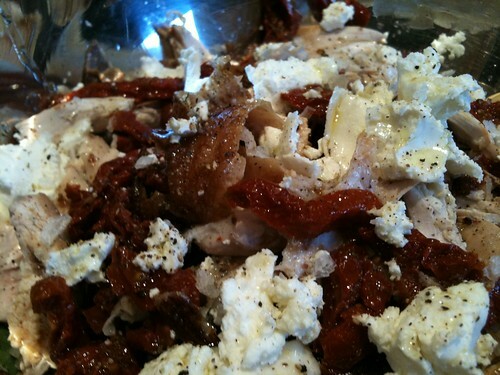 Low carb chicken salad packed with brazil nut fatty goodness, goat’s cheese and sun dried tomatoes. Recipe at Tummyrumble, my food blog.